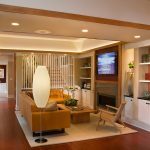 Jackson Moulding didn't intend to build a house but he craved living more sustainably. 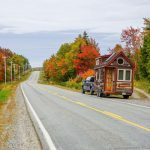 As he couldn't afford to buy a house he turned to self build as an option to realise his dreams. A local community group formed in response to the developer’s planning application. The group did not want to see the usual generic housing model so set about looking at what else could be done with the site. 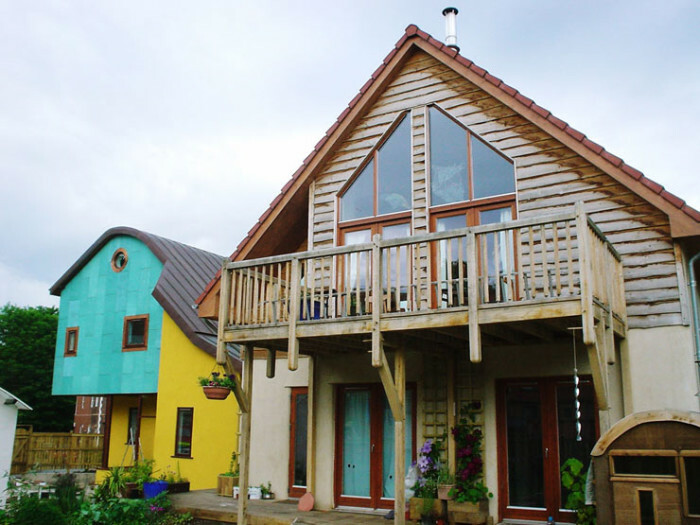 A member of the group lived on the edge of the site in their own self build house, and this helped inspire the members to pursue the idea of empowering people to build their own homes. The site was owned by a scaffolding company who had no particular interest in selling to the community. 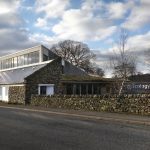 With the developer’s planning application already in place the community group knew they couldn’t just object to the plans but they would need to put forward some alternatives. Firstly they put forward their case of why the plans didn’t reflect what the community wanted, whilst also working out their own plans for a more mixed use, sustainable scheme. 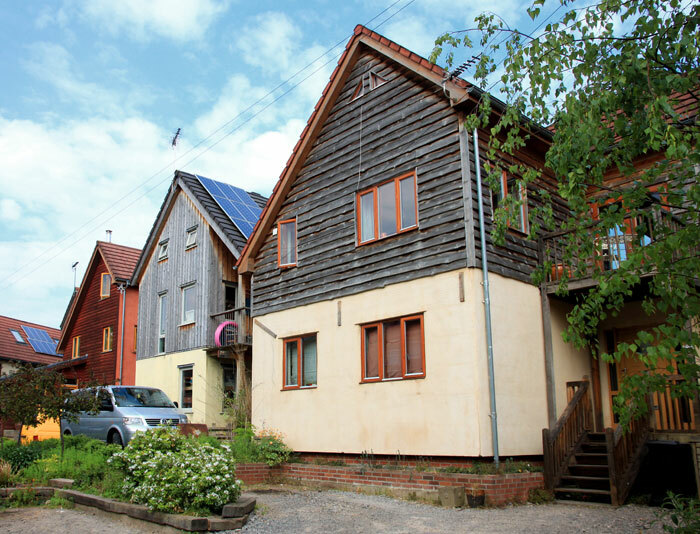 Members of the newly formed group researched existing group self build schemes, such as Findhorn in Scotland and Christiania in Copenhagen and took inspiration from this. 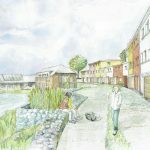 Along with the encouragement of some of the people who had been at their original community meeting, and particularly from those who had already self built, they were confident that a sustainable self build scheme would meet the objectives of the area. A number of conditions of the site had to be dealt with first, such as underground waterways and sewage pipes, before the layout and size of plots was determined. The cost price of the individual plots was based on the division of the land price together with an estimation of other things such as the costs of putting the services in. People who had expressed interest at one of the local events in purchasing a plot were asked to put down their 10% deposit once they had been successful in getting the developer’s planning application rejected. This sum amounted to £3000. At the point of exchange with the land owner they were all asked to produce the rest of the money for their plots, which became a fairly complicated process requiring legal representation from the action group, the land owner, and the self-builders. While only a few of the Ashley Vale Action Group (or their family members), including Jackson, did become one of the self-builders, the majority were involved just as interested community members who wanted to create the opportunity for other people to be able to live in the area in an affordable and sustainable way. 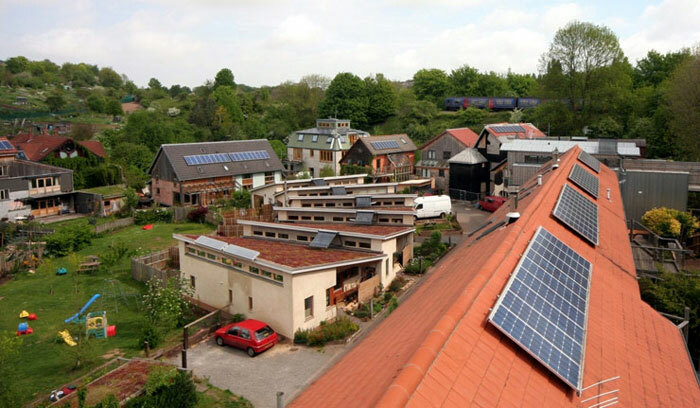 With the plots being sold as freehold, the owners were able to have complete freedom in how they wished to design and build their house, albeit within the action group’s policy of asking them to build sustainably, to think about their energy consumption, the materials they used and where they came from, and in a way that would be beneficial for future residents. 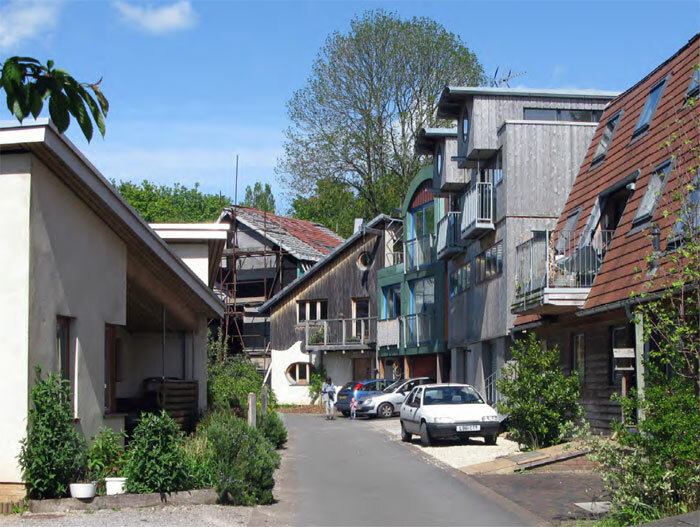 Whereas cohousing schemes have the conditions that members work together to build each other’s houses with the associated potential dilemmas of working out how to attribute each person’s time, this group benefitted from having the flexibility to work to their own schedules. The community group established training sessions for the self-builders to learn about different aspects of sustainable building and established a co-operative so that members could benefit from the economies of scale of buying together. 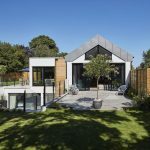 Some of the self-builders joined together to instruct timber frame manufacturers, whilst others did almost all of the hands-on building themselves. Although the process of allowing people to work to their own timescales meant that it was a building site for a number of years, Jackson credits it with fostering a sense of community. A number of the self-builders were living on site and with people at different stages of their builds there would always be someone to help out with advice about what they had done or were about to do. Rather than being dictatorial, the community have tried to remain positive and provide encouragement and support to try and resolve this, even offering to buy the plot from the owner. At the outset one of their key criteria was this should be an opportunity for people who didn’t have a home. However Jackson acknowledges this was also balanced with who was also able to provide the money for the plots at the time the money was required. In this particular case the self-builder has other property which means it’s a shame that people are not using it as a home or living as part of the community. Delegations have visited from around the world, along with local school children and architecture students. As an off-shoot of the original community group they have set up an organisation called Ecomotive, which runs workshops to help people through the process of coming together as a group. This scheme undoubtedly is the result of a progressive and enthusiastic community which has utilised much local expertise to enable people who otherwise wouldn’t have been able to buy or build their own home. Download a transcript of the interview with Jackson Moulding. 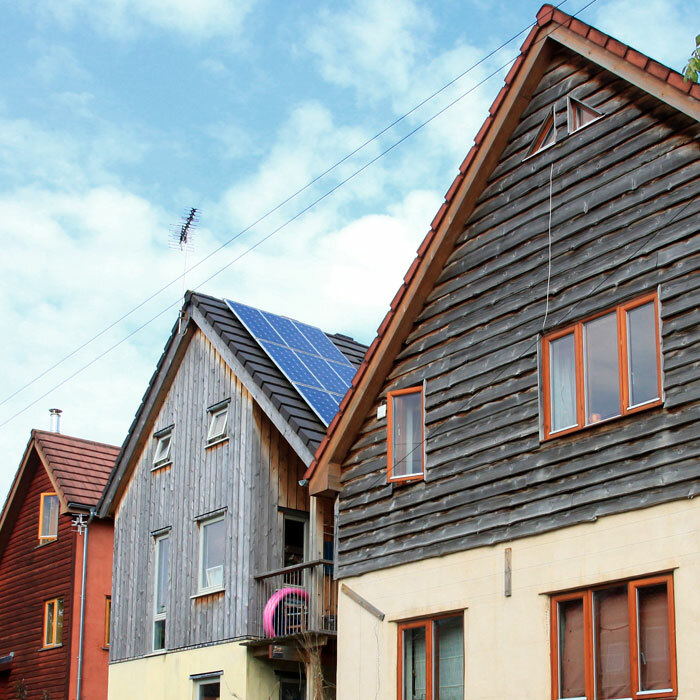 My wife and I recently visited Totnes on a research trip to experience a Passivhaus first hand. We can thoroughly recommend it. 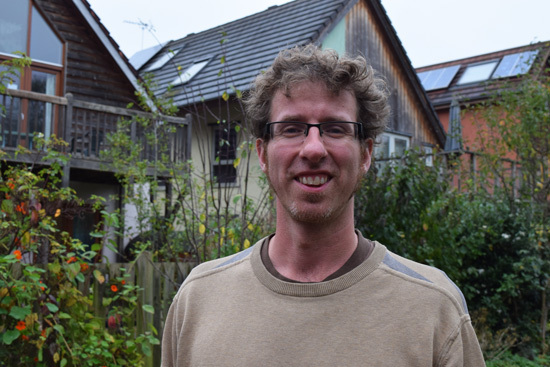 Not only can you ask hosts Adam and Erica all your Passivhaus questions, but you'll be very well looked after and there'll be a hearty British breakfast in the morning! You would also be in a beautiful part of the UK. If you want to find out more about the project, check out this video. It won in the UK Passivhaus Awards 2013.